When we moved into the house we decided this row of scabby old trees had to go. They were so tall they blocked all light in the garden, they were so thin at the bottom that Léon could easily walk out the garden on to a main road and they were plain ugly evergreens whose roots would eventually up-end the house. Our tree cowboy friend happened to be passing this morning and given the weather was nice, asked if I wanted him to fell the trees I had asked him to come back and fell in the spring. Why not? As I watched them for the next 3 or 4 hours, I suddenly realized quite how big a job it was and was glad Thomas and I had not attempted it with our chainsaw and my car as we had originally planned. 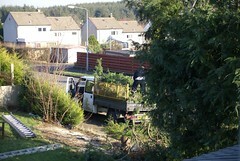 Surprisingly, it wasn't the felling that was the big job - that took them about 15 minutes a tree, it was the cutting up and disposing of the trees that took hours, as they chopped and heaved bits of them into their van and disappeared off to the dump twice for every tree. Now we have a scabby, bare, open back garden, so we need to get the planned fence asap. Then Pudge will be safe and Thomas can finally start planting his shrubs and bushes as planned.